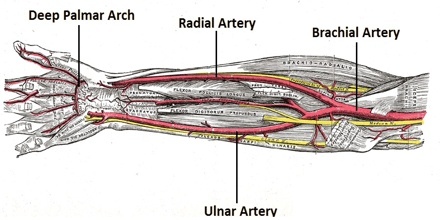 Ulnar artery is a large artery branching from the brachial artery, supplying muscles in the forearm, wrist, and hand. Arising near the elbow, it passes obliquely in a distal direction to become the superficial palmar arch. It has nine branches: four in the forearm, two in the wrist, and three in the hand. It is the main blood vessel, with oxygenated blood, of the medial aspect of the forearm. It arises from the brachial artery and terminates in the superficial palmar arch, which joins with the superficial branch of the radial artery. It is palpable on the anterior and medial aspect of the wrist. 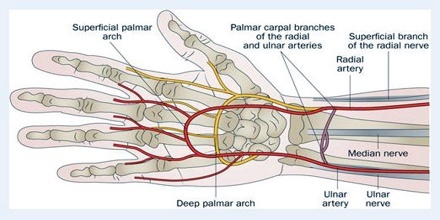 Palmar Carpal Branch: A small branch, it traverses the distal ulna beneath the flexor digitorum profundus tendons. Its anastamosis contributes to the palmar carpal arch. Dorsal Carpal Branch: This branch arises just proximal to pisiform. It travels deep to the tendon of flexor carpi ulnaris, onto the dorsal surface of the carpal bones. It travels deep to the extensor tendons, forming the dorsal carpal arch by its anastamosis. It supplies a small digital branch to the medial side of the posterior surface of the little finger. 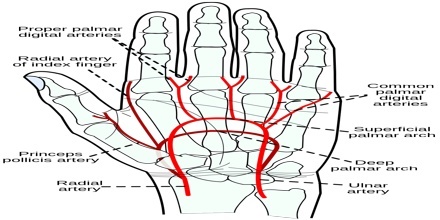 Deep Palmar Branch: Passes between flexor digiti minimi and abductor digiti minimi, either deep to or through opponens digiti minimi, alongside the deep terminal branch of the ulnar nerve. Its anastamosis completes the deep palmar arch. 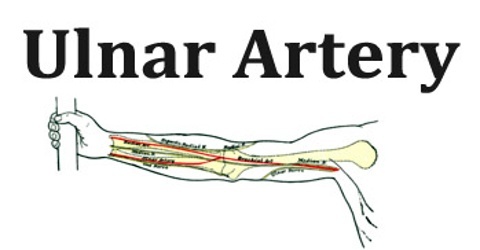 Other branches of the ulnar arteries include the posterior and anterior ulnar recurrent arteries. Both are located near the elbow. Ulnar artery is located in the elbow, and it is one of the branches of the brachial artery. The ulnar artery leads down the ulnar side of the forearm to the wrist. Ulnar artery branches off from the brachial artery below the bend of the elbow, at the area known as the cubital fossa. It runs the length of the forearm and ends at the superficial palmar arch. The superficial palmar arch is also known as the superficial volar arch. Some of the branches supply blood to the area around the elbow-joint, while others supply the flexor and extensor muscles in the lower arm. At the wrist, branches of the ulnar and radial arteries join to form a network of vessels, which supply the structures in the wrist, hand and fingers. The corresponding ulnar vein will parallel the brachial artery on its way back to the heart. Reference: healthline.com, ganfyd.org, innerbody.com, wikipedia.